This is in continuation of my last blog on Krishna’s flutes. I am sharing the below nectar from a lecture by HH Radha Govinda Maharaj on Venu Gita. We are all aware that the Venu Gita (Song of Lord Krishna’s Flute Play) is a compilation of twenty verses in the 21st chapter of tenth canto of Śrīmad-Bhāgavatam. HH Radha Govinda Maharaj first recited the below verse. Maharaj said that the words Venu, murali, bansuri etc. are used for the flute. In Sanskrit dhaar means wife, dhaara also means wife. Similarly Vamsi, venu, murali all stands for female gender. But it is neither female nor male. But Radharani is having the bhava that this flute is a male. So she is saying that this flute even after being a male is drinking that which we females are supposed to drink. So she is thinking, oh why did I and all of you sakhis, take birth as a gopi, why did we not take birth as a bamboo !! What austerity has this flute done ? It is always in the hands of Krishna or on his lips or on his hips, never away from Him! Maharaj then quoted Srila Vishvanatha Chakravarti Thakura, who wrote that Radharani is saying – what austerity did this flute do ? what charity did it do, to whom ? what sacrifices did it do ? Then we all will also do the same. The bamboo has no rasa, no fruits, no flower, still what austerity did it do ? In this birth, he has not done anything. May be in his previous birth he was a human and did something. Please find out, so that we can also do the same and achieve this fortune of drinking the nectar of Shyamsundar’s lips. Maharaj next explained Why is the word ‘Damodar’ used in this verse, not any other name ? Maharaj quoted Srila Sanatana Goswami who says that Damodar word has the name Radha hidden in it – as in Radha Damodar. Also it shows the love that Yashoda maiya had by which she could tie him up. Also, Radha has also tied him up with flower garland. So it is Radha’s Damodara – this is the hidden bhava. If Radharani would have said that Krishna’s lips are meant for females only, it would have been wrong. Because, there are females even on heavenly planets, earth, etc. But it is not meant for any of them. It is meant only for the gopis alone. That is why here in this sloka, Radharani is saying that it is meant for the gopis alone. Radharani continues to say – This Shyamsundar never goes against the flute. He is always on his side. 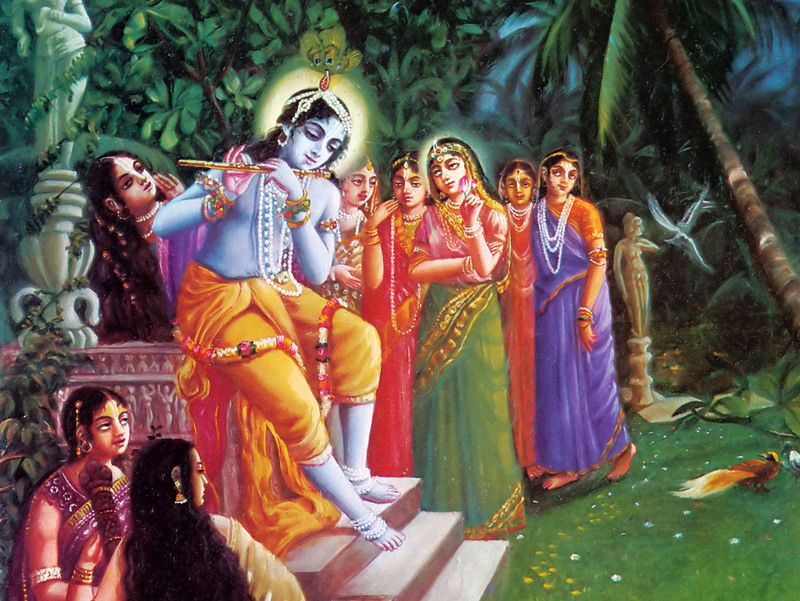 Sometimes Radharani finds no fault with the flute, and puts all the blame on Krishna like this. It is Krishna who is constantly keeping the flute on his lips. He could keep it on his waist, or in his hands, why lips ? He wants to enjoy the flute ! Radharani is saying – This flute drinks the nectar without leaving even a drop for us. We get only a taste of his lips. That’s all the flute leaves for us. We are getting the remnants of the remnants of the remnants of the flute. Maharaj said that the gopis also complain that to play the flute, Krishna has to bend himself in three places then Krishna has to bend and bow down his head in order to play it! And Krishna has to massage it by his fingers in order to play it. Like this the flute is making Krishna do so much seva to play on it! The flute thus makes Krishna dance and makes all of us also dance in madness!! Hey gopis, why are you blaming me ? What wrong am I doing ? If I am drinking Krishna’s adharamrit, then I have definitely done something to drink it, is it not ? Why are you blaming me that I have no right to drink and I’m forcibly drinking it ! Go ask Shyamasundar, that after facing how much of distress I have received this love ? Got His association, after how much of austerities, how much of miseries, you ask Shyamasundar Himself! I gave up my roots, branches, leaves everything. (to make a flute, all these has to be cut off. Can anyone imagine to have their hands cut off, legs cut off !) and then I have got dried up in the hot sun. In order to make holes in me chest, I was poked by the fire like iron, and I did not cry with my body or mind or words, and in this way 7-8 holes were made on my body. My body did not even turn or twist when this hole was made. Why do you keep calling me – bansuri, baans wali…etc. and you people keep blaming me in tamo guni krodh ? You too do such austerities like I did, and take this right of His adharamrit, what is the use of talking ill about me? You cannot move me out of my place, by saying all this. I will not move from my place, it is my right. I will remain here only! So in this most beautiful way flute gave a fitting reply to all the gopis! In the end I can again only pray that after reading this nectar may all the readers, including my own self, develop the desire to glorify and serve Krishna’s flute and pray that one day every part of our body can also be somehow used in the service of all those servants who are serving Krishna, and His associates, with so much love and affection. All glories to the Mahabhava of gopis. All glories to Krishna’s flute. This entry was posted in ISKCON, Krishna, My spiritual Journey and tagged bansuri, gopis and Krishna's flute, HH Radha Govind Maharaj, Krishna, mahabhava, mahabhava prema, murali, Sanatana Goswami, Srila Jiva goswami, Srila Vishvanatha Chakravarti Thakura, surdas ji, venu geet, venugita, Vraja bhasha, vraja prema. Bookmark the permalink.